Vampire Victor Renquist travels to “the Hollow Earth,” actually a series of underground caverns that can be reached from various points on Earth. Renquist spent time in England during World War II monitoring an occult warfare unit working out of Ravenkeep Priory under the command of the Duke de Richleau. Marcus De Reske’s attempts to raise Cthulhu are mentioned. Pelucidar is another of the Hollow Earth’s names. A member of a serpentlike race called the Dhrakuh tells Renquist, “the English eccentric, Professor Challenger, had made it into one of the subsidiary caves, but never discovered a major underground city, unlike the Norwegian, Nielsen, and two years later, the Prussian, Erich von Stalhein, who had come with a well-equipped expedition funded by the Krupp family.” The Duke de Richleau is from novels by Dennis Wheatley. Cthulhu is, of course, one of the Great Old Ones in the fiction of H. P. Lovecraft. Marcus De Reske was prevented by Renquist and his nosferatu coven from releasing Cthulhu in the second novel in the series, Darklost. The name “Pelucidar” is a variant on that of the world at the Earth’s core from the novels of Edgar Rice Burroughs. 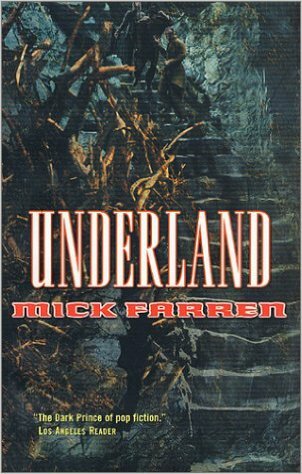 The land seen in Underland is clearly not Burroughs’ world, but both this novel and Steven Utley and Howard Waldrop’s story “Black as the Pit, from Pole to Pole” indicate there are many inner worlds. Professor Challenger appears in The Lost World and other works by Arthur Conan Doyle. Nielsen is not a pre-existing character, but Erich von Stalhein is the archenemy of W. E. Johns’ heroic aviator Biggles.